This is a great recipe you can throw in the slow cooker before work and have a delicious meal just about ready to go when you get home. You can use dried beans you’ve already cooked or canned beans. If you use canned beans, look for low-sodium versions and rinse them well to remove even more before adding them to the meat. If you don’t have quinoa on hand, try with brown rice or other whole grains. The original recipe called for flank steak, but to make it a bit more budget friendly I went with a sirloin tip roast… and I actually don’t care for black beans all that much, so I used pinto. Spray 3 1/2- to 4-quart slow cooker with cooking spray. In cooker, place onion and peppers. Top with beef. Sprinkle with chili powder, oregano, garlic and salt. Drizzle with lime juice. Add 1 cup of broth. About 20 minutes before serving, cook quinoa as directed on package using 2 cups of beef broth. Remove beef from cooker; place on cutting board. 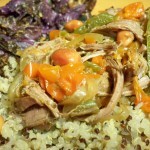 Shred beef with 2 forks; return to cooker and mix well. Stir in black beans. Increase heat setting to High. Cover; cook about 15 minutes longer or until thoroughly heated. 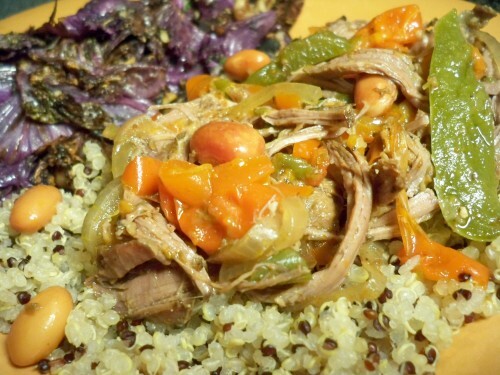 Serve beef and sauce over quinoa. I served this with some kale that I sautéed with a bit of garlic, walnuts and olive oil.